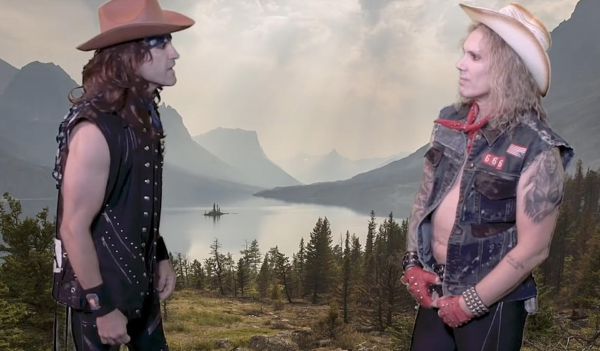 STEEL PANTHER JUST RELEASED A BIZARRE ‘BROKEBACK MOUNTAIN’ SPOOF? OF COURSE THEY DID! They guys in Steel Panther must have some spare time on their hands as they have just released a bizarre montage of classic moments from some of the silver screens most popular movies. With the follow-up to ‘Lower The Bar’ apparently in full swing, L.A comedy sleaze crew are pestering the internet with a series of short parody clips from classic movies which they have titled as “Cineminute,”. In the latest bizarre clip, frontman Michael Starr and guitarist Satchel re-enact a scene from the Heath Ledger and Jake Gyllenhaal film Brokeback Mountain. Tickets for Steel Panther’s Irish shows in February are now available via Ticketmaster with Wednesday, February 6th show completely sold out. Additional date for Dublin’s Vicar Street on February 5th as well as their Belfast Ulster Hall on February 7th are on sale now with limited tickets remaining. Please check Aiken Promotions for further details.